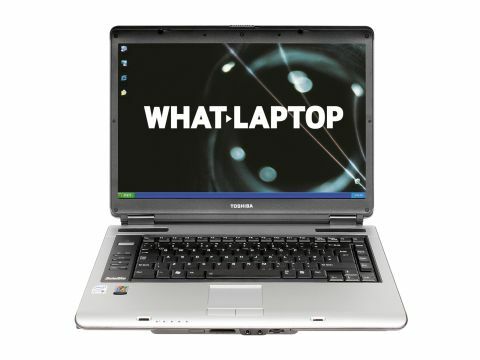 The Toshiba Satellite A100 (£999 inc. VAT) comes with Windows XP Media Centre Edition pre-installed, and has a number of features that make it a useful multimedia machine. The 15.4-inch Super-TFT screen is average at this price, and colours are reproduced faithfully. The display remained viewable from a range of angles, making it ideal for watching movies. There's a dedicated graphics card in place, although in this machine it's an older low-end solution. However, performance from the Nvidia GeForce Go 7300 card lags a long way behind other dedicated GPUs. Scoring 3300 points in our 3DMark 2003 benchmark, you'll still be able to carry out light multimedia tasks, but most modern games are out of reach. Unfortunately, the dedicated GPU also has an effect on battery life, which offered just two hours between charges. At 1.66GHz, the Toshiba's Intel Core 2 Duo T5500 processor has a pretty slow clock speed too. However, 2048MB of memory holds data ready for the processor, and helps to give performance a boost. We found it to be a rapid machine in day-to-day use, with little lag when running applications. Much of the Toshiba's construction is beyond reproach - the chassis is made from hard plastics, and the curved bezel at the screen's edge helps to protect the display when travelling. Sturdy casing at the rear of the display gives the impression this laptop will last. However, the otherwise impressive build quality was let down by the keyboard. Multimedia keys on the left mean the keyboard is offset, making it tricky to type with any degree of comfort. The keyboard also bounced under slight pressure, with the surrounding keys moving in addition to the one you strike. The speakers are made by premium audio manufacturer Harman Kardon, and offer reasonable sound quality. Hotkeys make listening to music or watching movies a pleasure, and make it easy to skip through scenes and pause at the touch of a button. There's no DVI-out port for digital connections so users will have to settle for analogue connections to external displays - using S-video or VGA-out ports. The Toshiba Satellite A100 has plenty of performance for most requirements, and offers a good balance between cost, features and build quality. Unfortunately, the keyboard certainly makes it difficult to recommend for heavy use.